Where footprints of indiscriminate development are still dim, chirping of the birds louder than noise of cars and peace mightier than bustle, Naukuchiatal is such a pearl preserved in the shell of nature. Actually no words can do justice to explain the heavenly beauty of Naukuchiatal, or the lake with nine corners that no one has counted nine so far. 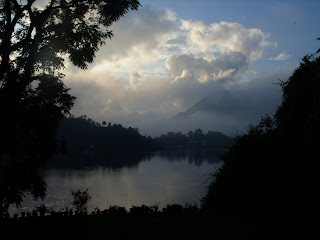 It is for experiencing in real the many breathtaking hues of the lake in one single day. We (we both with parents) stayed right by the lake in an ideal holiday resort, Lake Resort. To be back in the hills after Simla was a respite for our souls parched from the heat of the city. The resort was surrounded by lush green forest and our natural instincts (well, instincts that were developed in the US) took us into the forest and we measured many inches observing big trees, many birds and yes! insects. End of June may be the best time to visit as we saw plenty of varieties of birds around. Sadly they are anonymous as none of us was a bird specialist, though we all enjoyed the magical symphony created by them. Occasionally one may also see a crab and we saw one with its younger one. Temperatures are naturally cool and the drizzle pleasing and yummmm what goes best with it :). Earth is no less than heaven when you are served chai and sumptuous pakoras on a rainy day. Boating in the lake was fun as well. 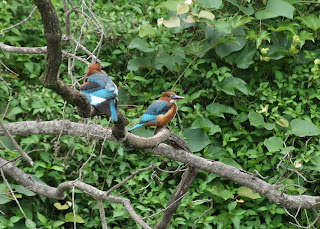 We got to see a couple of kingfishers (I think they were kingfishers) up close. Of course seeing the hills around is another delight. We also did a side trip to Bhimtal and were glad that people do not venture to come slightly further and have not yet polluted Naukuchiatal similar to Bhimtal. By the way, one must try avoiding NH 24 when traveling from Delhi. It is under construction and that stole precious 4 hours each side from us that could have been better spent relaxing at Naukuchiatal.